As a WooCommerce store owner, you probably need to attend to multiple things at the same time. There will be a lot of such things that are repeated over a period of time. This constitutes a workflow. Basically, the workflow is a harmonized activity on your store, that is repeated frequently. Interestingly, if you have an organized workflow, a lot of things will be in order, and you can prioritize and focus on urgent things. This is where Zapier comes into the picture. It is a workflow automation tool that helps you integrate various web tools that you use on your WooCommerce store. This article intends to cover the basics of WooCommerce Zapier integration and the apparent advantages. How workflow automation helps your store? A typical WooCommerce store owner’s workflow involves moving data to and from the store on a repeated basis. For example, you might need to import a list of customers to a spreadsheet before deciding on a promotional offer. The need for manual effort in such tasks might be a constant annoyance in your busy day. With advanced workflow automation, a lot of such tasks will happen in your store without you even knowing it. As a result, the efficiency of your store considerably increases and it will soon start to reflect in your profits too. There are multiple tasks that you daily encounter on your WooCommerce store, which can be automated. Creating an email list for your marketing initiatives, printing invoices, and shipping labels, exporting order data, customer relationship management, etc. are some of them. Once you are able to automate such tasks, you can save a lot of time that you can efficiently utilize in other aspects such as growing your business. How does WooCommerce Zapier integration help? As a WooCommerce store owner, you need to be focusing intensely on diversifying your product list, devising innovative marketing strategies or improving customer satisfaction. However, if most of your time is spent on other repeated tasks mentioned above, there is something wrong with the workflow. WooCommerce Zapier integration becomes relevant here, as it links to more than 750 of web tools that you commonly use. Furthermore, the list includes popular tools like Zendesk, QuickBooks, Gooogle Sheets, Trello, and a lot more. The automated workflows of Zapier are called “Zaps”. You can create these workflows for a lot of things. For example, it will help you bring together data in multiple tools or applications to one place. In such a scenario, you don’t need to log into each of these tools on a daily basis. Similarly, you can completely free yourself from manual data entry. This will save a lot of time for you, and also helps to reduce a lot of errors. Basically, using Zapier you can maintain your workflow in a pattern that is most suitable for you. And all this can be set up in a simple and seamless manner, even if you are not a technological wizard. How Zapier works with WooCommerce? Basically, Zapier opens up a whole new level of possibilities to integrate multiple third-party tools that you use on your site. “Zaps” will manage the interlinking of data between multiple tools that you use on a daily basis. For example, when you get a new sale on your Stripe account, you can generate an invoice in QuickBooks. At the same time, send a welcome mail to the customer using Infusionsoft, and adding the customer to MailChimp list. This way, you can think of any combination of actions as you require. Integration with over 20 accounting systems. Synchronize customers with more than 50 CRM tools. Include customers using mailing lists such as Mailchimp or CampaignMonitor. Send notifications to customers through email or SMS. Update your documents and spreadsheets. Sync your help desk system for better support. If you are wondering how all this works with WooCommerce, it is simple. You can initiate zaps based on some of the common events on your WooCommerce store. These include a new customer registration, a new order received, change in order status, or addition of another product in the order. How to integrate WooCommerce and Zapier? 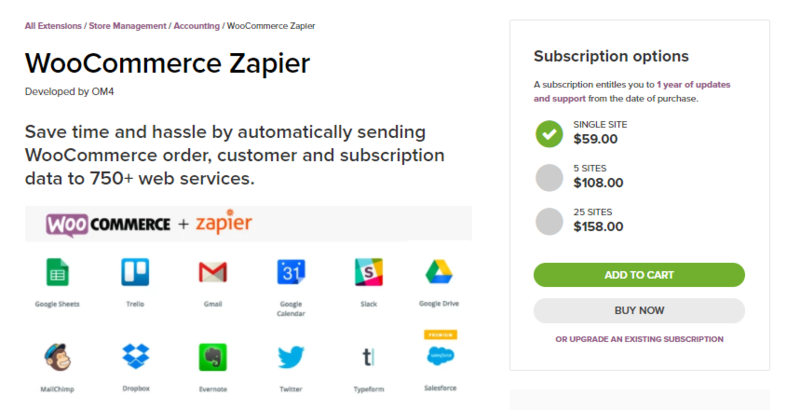 You need to purchase the WooCommerce extension for Zapier integration. A single site subscription would cost you $59. 5-site and 25-site subscriptions too are available at $108 and $158 respectively. From the date of purchase, you will get updates and support for this extension for one year. You also need a Zapier account for this to work, which you can signup for free. Fundamentally, it will help you send your WooCommerce customer, subscription and order data to over 750 different web services. 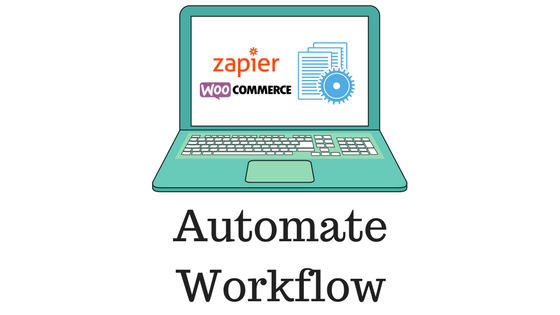 WooCommerce Zapier integration helps you immensely to automate multiple facets of your workflow. Using this extension, you can integrate some of the popular web services such as Google Drive, MailChimp, Campaign Monitor, FreshBooks, Zendesk, Dropbox, etc. You can accelerate the workflow of your store by triggering actions based on store events. For example, every time a new customer registers, you don’t have to manually make any changes. Just let the extension take care of what needs to be done when you focus on other aspects of your store like including new products in your store. You workflow often will have multiple steps involved in it. And, there are chances that you may miss one step in the process and it leads to further hassles. With Zapier taking care of your workflow, you will never have a single issue like this. Each event on your WooCommerce store will trigger changes in different services, with Zapier silently integrating everything. With Zapier, you can be always prepared to face any adverse events in a store. For example, if a customer cancels an order, you will be able to quickly address the issue. A timely intervention can most probably encourage the customer to continue with the order. Similarly, following up with customers right after they make a purchase on your site, can help in improving customer perception. Such timely actions will help in improving the overall efficiency of your store as well as creating a feel-good factor among customers. Often, when you are running a business, it is equally important to keep the communication channel open between internal teams too. You can notify your team members according to the relevance of the information. For example, if a customer has added another item to his/her order, the information should go only to the concerned teams. There is probably no need to inform your marketing team about it. As a result, information transfer will be more streamlined in your store. In addition, you will get detailed reports on your store’s functioning in a timely manner. This is achieved with the help of a tool called ‘Digest by Zapier’. It aggregates content from multiple services and displays it in one place for you to access easily. You can set it to provide reports daily, weekly or monthly according to your convenience. Zapier triggers are effected from WooCommerce order, customer, subscription data changes. Comprehensive support for WooCommerce payment methods, shipping options, and currencies. Data encryption for enhanced security on your data transfer. Filter notifications based on users, groups or teams. Supports WooCommerce simple and variable products. Search for specific data in the integration with a particular tool. Option to let other WordPress plugins override or customize the data sent to Zapier. Great support for a variety of WordPress plugins commonly used by WooCommerce stores. Zapier helps you integrate multiple tools that you use on your store on a daily basis. Let us look into some of the common Zapier integrations in more detail. Trello is a great project management tool that is used by many businesses to manage their projects. It helps you have a bird’s eye view of your various projects. You can use it to track the ongoing activity, upcoming work, and finished projects. Information is organized into boards, lists and cards in Trello, which you can update according to the progress of the activity. Zapier creates a new Trello card every time a new WooCommerce order comes to you, enabling you to focus better on fulfillment. For example, there might be several additional requests along with one order, that your team needs to look into. You can easily track the progress of these activities with Zapier Trello integration automatically. You can simply use the Zap “Create Trello cards from new WooCommerce orders”. Zapier even enables to help you move your cards across lists with status changes and the like. Customer relationship management is an essential aspect of the progress of any kind of business. A good CRM tool would help you manage user data in intelligent ways to boost sales conversions. How about automating the transfer of customer information from WooCommerce to your CRM system? It would save you a lot of time while making your CRM more efficient. In fact, you can have a consolidated view of customer information for your marketing, sales and support teams. This helps immensely in devising an orchestrated effort to boost your sales and brand value. You can read more about some of the awesome WooCommerce CRM tools here. Zapier helps to create a record in your CRM every time a new order is placed in your store. This relieves you from doing a lot of manual work of importing customer data from your WooCommerce store to the CRM system. You can organize the customer information according to the CRM tag that you use to segment customers. For example, tags like loyal customers, leads, opportunities, etc. can be made use by relevant teams who are working with it. Accounting can create a lot of hassles for small business owners, who thrives on a small team. So it is natural to use an efficient accounting tool like QuickBooks to organize your transactions. Zapier helps to easily pass on your accounting data to QuickBooks. For example, there is a zap to “Create QuickBooks online receipts from new WooCommerce orders.” This will really help store owners to keep sales information in an organized way. There is also another zap that helps you add new orders as a new customer in the QuickBooks account. Thus Zapier integration helps to make your account management even better while using tools like QuickBooks. If you have the habit of keeping data in spreadsheets, every time a new order comes, you have to copy and paste it. Zapier will completely free you from such repetitive tasks by automating the whole process. You can simply use a pre-defined zap to “Save new WooCommerce orders to Google Sheets rows.” This will also save you totally from the hassles of accidentally missing out on certain orders. Maintaining an email list a priority for your marketing team. It is important to update this list at regular intervals to grow your customer base and thereby future sales. So, every time a new customer purchases something from your store, you want to add the contact to your email list. Zapier helps to automate this process too. You can set it to function so that every new customer is added to the email list. This way, you can continuously engage your customers with new product information, newsletter subscriptions, etc. Automating the workflow on your WooCommerce will save you a lot of time and manual effort. A unique solution to integrate multiple web services on your WooCommerce store is Zapier. It is a workflow automation tool that integrates with 750 popular web service applications. Transferring data from your WooCommerce store to each of these services itself can be a time-consuming task. And on top of that, these importing tasks can be repetitive and mundane. WooCommerce Zapier integration plugin does a great job in helping you with the process. This article probably has provided you enough scenarios to understand the practical value of Zapier integration. Please let us know if you wish to share an insight, or if you have a query.